Roxanne Ando began Chinese water color painting as a way of connecting to her Asian heritage, studying with local Chinese painter, Helen Sze McCarthy for several years. 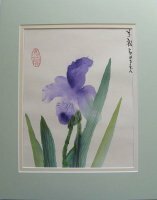 The zen of brush painting---from learning about brushes, paint and water; to making the paste; to wet mounting the pictures---has a distinctively Asian flavor. What I love about it are the dualities. It's a study in both process and product, requiring control and freedom, technique and inspiration, black and white versus color. Learning to paint in this style has renewed my love of flowers, gardening, and nature. My work can also be seen at etsy.com (under the seller name “Penandpaintbrush”).